Tony Blair rises every couple of months, like a bubble of swamp gas. First there’s an uneasy buried rumbling, then small tremors shake the surface, and then suddenly he bursts through, a gassy eruption stinking of farts and sulphur. It doesn’t matter how many rounds you fire into his shambling frame; he just won’t die. Whenever something unpleasant happens in the Middle East, whenever some huge corporation is discovered to be starving people to death or poisoning them through calculated negligence, whenever the chaos of the international order starts to wobble into another death-spiral, a damp wind blows through a graveyard somewhere in England and Tony Blair emerges from his tomb. There’s something viscerally revolting about the man. His fake chumminess and his sham gravitas are both as nauseatingly contrived as his shiny oily skin, hiding what can only be bloated rotting organs inside. He’s a gremlin, an incubus, very strange and very cruel and very foreign to our world. But still there’s a decaying vestige of that charm, the memory of the love in which he was once held, that universal joy when he finally ended a generation of Conservative rule by ending the Tory monopoly on evil. We’ve deluded ourselves into thinking that we’ve learned from the experience, we’re past all that now, but every time Tony Blair re-emerges there’s still a shock. There he stands, with his jug ears and his peg teeth and his manic eyes full of an otherworldly certainty – it’s like the shock of seeing a former lover going through your bins at night, or a long-forgotten childhood toy waiting for you on your bed. He represents something that’s been repressed, and even though the repressed always returns, it’s always a surprise. Who is this hideous figure? Why is he still alive? Why won’t he just leave us alone? Of course, Tony Blair was never alive. He’ll never leave us alone. While on the subject, The Saker hits one out of the park as well ('see who will get the title of "employee of the month" from Uncle Sam'). I haven't been following the World Cup as closely as I'd like to. To be honest, I'm not sure whether I'd really like to; I know this sounds like heresy coming from somebody who watched every match in Italia 90 at least twice--once live, one or more times the repeats, but the fact is that most of the action in a football match seems to have become quite pointless to me. There are spells when somebody does something breathtaking on the field or when a team is laying siege to the opponents' goal in a do-or-die battle to survive as the clock is ticking inexorably, but the rest of the time the action is not dissimilar to the Simpsons parody of soccer. The cynical attitude of the players doesn't help either. I have mentioned this earlier too, but the one question that comes to mind when watching their antics is "Dude, what the hell were you thinking when you did that? ", be it van Persie's blatant shirt-pulling in the opposition penalty area, or Arjen "The word you're looking for is sissy" Robben's *ahem* 'simulation'. I made this table mainly to confirm and schadenfreude over (a. yeah, not a verb, and b. can't believe I spelled 'schadenfreude' correctly on the first try) England's misery, then thought I might as well share it -- joy shared is joy doubled and all that. The only scenario where England makes it to the knockout is the one in red, even then subject to other factors (goal difference? phase of the moon?). 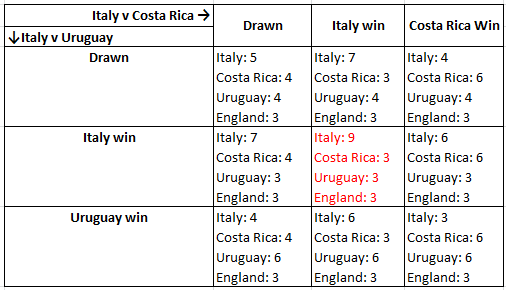 All this is based on the assumption that England beat Costa Rica, of course. The violation of the law of conservation of points (ever since they introduced three points for a win) grates as usual.